SPIDER-MAN TO SWING BY BALLPARK ON AUGUST 4TH! 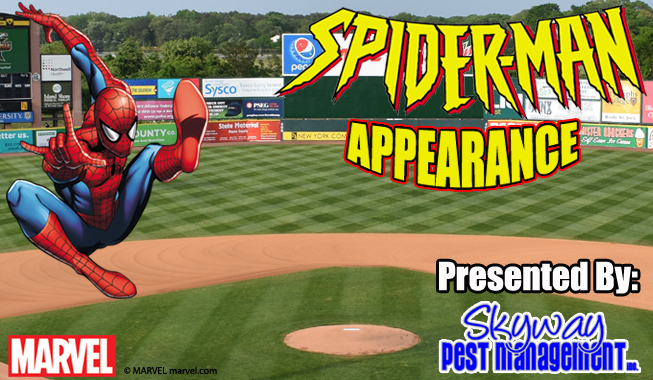 (Central Islip, N.Y., Feb. 4, 2019) – The Long Island Ducks today revealed that the Amazing Spider-Man will be appearing at Bethpage Ballpark on Sunday, August 4th, courtesy of Skyway Pest Management. The webslinger will be making his return to the ballpark following the debut of his newest movie, Spider-Man: Far From Home, which premieres on Friday, July 5th. Fans attending the Ducks 5:05 p.m. game on August 4 against the Atlantic League’s newest team, the High Point Rockers, will have the chance to meet the famous superhero. Spider-Man will be making his way around the main concourse and will be posing for pictures with fans, young and old. Additionally, he will be throwing out a ceremonial first pitch prior to the start of the game. Along with Spider-Man’s appearance, those at the August 4th game will also get to enjoy the team’s Sunday Family Funday activities, presented by Bethpage Federal Credit Union. Prior to the game, fans will be invited onto the field for an autograph session with the Ducks. After the game, kids (and kids at heart) will have the chance to run the bases on the Ducks playing field. Fans wishing to guarantee the best available seats for this game, and for all Ducks regular season home games, are encouraged to become VIP season ticket holders. CLICK HERE for details on the Ducks season ticket package. The August 4th game is also included in the Third Baseman package of a Ducks mini plan, and all mini plans include a FREE game ticket voucher that can be used for the game. CLICK HERE for information on Ducks mini plan packages. Individual tickets to the August 4th game will go on sale in mid-March at the team’s annual Opening Night of Ticket Sales event. Stay tuned to LIDucks.com or sign up for the Ducks email newsletter for further details. The remainder of the Ducks 2019 Promotional Schedule will be announced in advance of the event.